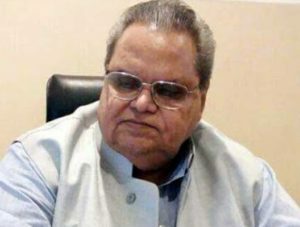 In a surprising development Jammu and Kashmir Governor Satya Pal Malik dissolved the state assembly on Wednesday late evening. His orders came amid claims of forming government by former chief minister Mehbooba Mufti and also by JK People’s Conference leader Sajjad Lone. Mehbooba Mufti claimed that PDP have support of 56 MLAs including National Conference and the Congress . According to the information Mehbooba letter could not landed in Governor’s office as there was some snag in the fax machine. However, it is not clear that whose machine was out of order. It is said that Sajjad Lone sent his claim through whatsapp to Governor’s officials. However, Governor has dissolved the Assembly. 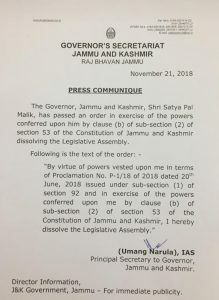 Meanwhile PDP chief Mehbooba Mufti has strongly condemned the Governor’s order of dissolving the state assembly and describing it has ”unconstitutional”. She said when party is in position to form the government how decesion of dissolving the assembly can be taken. On the other hand Sajjad also made claim to form government. According to informations Sajaad Lone claimed that he has the support of 26 BJP legislators and 18 others which is the magic mark to form the government in 87 house. 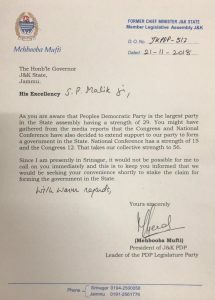 PDP chief Mehbooba Mufti also tweeted a letter that she has been trying to send letter to Governor Satya Pal Malik, which states that since she is not in Jammu currently, she will soon be meeting him to stake the claim for forming the government in the state. All these developments came after hectic political developments on Wednesday evening when PDP leader Altaf Bukhari claimed that National Conference and Congress have agreed to form government with the PDP in the state. 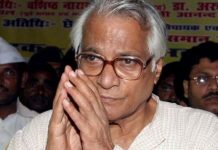 National Conference had also summoned meeting of the core group on Thursday to take a final decesion on it. It is said that BJP was not in favour of PDP-NC-Congress and it tried to sabotage their effort through Sajjad Lone, who also staked claim for formation of government in the state. The political developments took interesting turn on Monday when senior PDP leader MH Beig, who is one of the founder members of the party, announced that he will support Sajjad Lone if he claims to form the government. This was an indication that PDP may break which put party leadership in worry. Same was case with the National Conference and the Congress who were fearing that there members may shift loyalities. 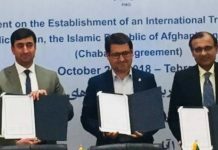 According to sources after this senior leaders of all the three parties decided to stake cliam to form the government. They were aware that Sajjad Lone and BJP can not form government withour breaking their parties. 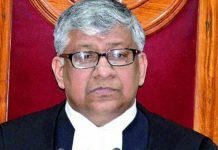 All the three parties knew that their claim will put pressure on the BJP and will try to dissolve the Assembly or if Governor agress to their claim and ask them to form government they will do so. Sources said that Governor SP Malik has recently visited Delhi and had held meetings with the Prime Minister Narendra Modi and he have also met BJP chief Amit Shah. There are reports that BJP high command was not in favour of forming the government with the help of dirty tricks. Now Assembly has been dissolved and coming days will be interesting in the state. However, dissolution of the Assembly have paved path for the fresh elections in the state.